(Nanowerk News) Modern research has found no simple, inexpensive way to alter a material’s thermal conductivity at room temperature. That lack of control has made it hard to create new classes of devices that use phonons — the agents of thermal conductivity — rather than electrons or photons to harvest energy or transmit information. Phonons — atomic vibrations that transport heat energy in solids at speeds up to the speed of sound — have proved hard to harness. Now, using only a 9-volt battery at room temperature, a team led by Sandia National Laboratories researcher Jon Ihlefeld has altered the thermal conductivity of the widely used material PZT (lead zirconate titanate) by as much as 11 percent at subsecond time scales. They did it without resorting to expensive surgeries like changing the material’s composition or forcing phase transitions to other states of matter (Nano Letters, "Room-Temperature Voltage Tunable Phonon Thermal Conductivity via Reconfigurable Interfaces in Ferroelectric Thin Films"). 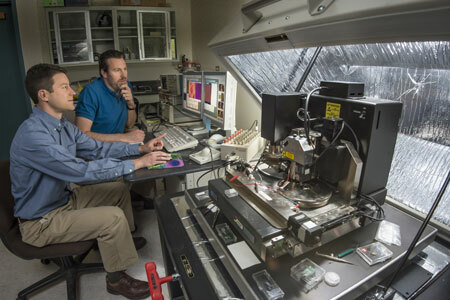 Sandia National Laboratories researchers Jon Ihlefeld, left, and David Scrymgeour use an atomic-force microscope to examine changes in a material’s phonon-scattering internal walls, before and after applying a voltage. The material scrutinized, PZT, has wide commercial uses. PZT, either as a ceramic or a thin film, is used in a wide range of devices ranging from computer hard drives, push-button sparkers for barbecue grills, speed-pass transponders at highway toll booths and many microelectromechanical designs. The work was performed on materials with closely spaced internal interfaces — so-called domain walls — unavailable in earlier decades. The close spacing allows better control of phonon passage. The researchers, supported by Sandia’s Laboratory Directed Research and Development office, the Air Force Office of Scientific Research, and the National Science Foundation, used a scanning electron microscope and an atomic force microscope to observe how the domain walls of subsections of the material changed in length and shape under the influence of an electrical voltage. It is this change that controllably altered the transport of phonons within the material. Ihlefeld points out that active control of electron and photon transport has led to technologies that are taken for granted today in computing, global communications and other fields. “Before the ability to control these particles and waves existed, it was probably difficult even to dream of technologies involving electronic computers and lasers. And prior to our demonstration of a solid-state, fast, room-temperature means to alter thermal conductivity, analogous means to control the transport of phonons have not existed. We believe that our result will enable new technologies where controlling phonons is necessary,” he said. The goal of future work is to reach a better understanding of “what caused this effect to happen so efficiently,” Ihlefeld said.